It's that time of year where all of my vegetables are ripe and we have been harvesting them as fast as we can. I love gardening and I love making a variety of recipes with freshly picked veggies. This recipe is a great one for those of you who have a lot of different types of veggies on hand that you just want to use up. It's a great side dish or use it as a main dish like my husband and I do. If you don't have zucchini on hand...you can certainly use some yellow squash. Add the olive oil to the bottom of your skillet and bring it up to temperature over medium heat. Dip your sliced zucchini into the lightly beaten egg mixture to coat them and then dip them into the seasoned bread crumbs. 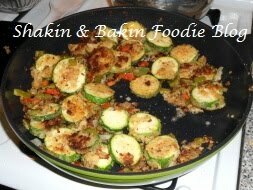 Place the breaded zucchini along with all of the rest of the ingredients into your hot skillet. Simmer mixture over medium heat for 15 minutes, stirring often to prevent sticking and to make sure all veggies get cooked. They are done once they are fork tender. Serve immediately.